Click here to see our Glossary page. A Ramblers Comment in the Shields Gazette 19/1/16 and IF response (bold). I don't really agree with the comments on this, though I do share some of the concerns about how much money has been spent in reinstating this public right of way. 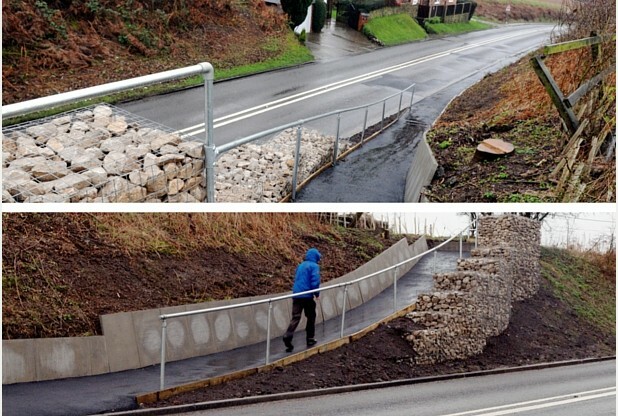 The Council spent the money because the Ramblers insisted on 'public' rights. Rights for Rights sake! No good trying to pass the blame after the event. The Ramblers and Open Spaces 'find' unused paths.They do not have any criteria for 'claims' which may or may not be proved correct.Councils also do not use any filter system for claims and are legally obliged to investigate,pay for public enquiries and consider objections at every stage regardless of cost. This is an old footpath, which has been put back where it should have always been. Why? When it was an 'old' footpath it probably had a necessary use. To walk to work...no road,no cars....Why would it be necessary or advisable to put back a path which has fallen out of use, in an unnecessary and dangerous place just for the sake of it? Times change! Shall we reinstate work houses and reinstate coal fires in every situation? Shall we insist that horses and carriages have the right to use motor ways because they went that way in the past? If you walk along the path from Haggs Farm, you will now be able to cross the road and continue along the path to Kirk Hallam. Previously, you had no choice but to walk down Cat & Fiddle Lane, with no pavement, and with heavy lorries passing by every other minute, till you got to the next path. Having done this on several occasions, it was a potential death-trap. Well insist on a pavement then or insist that the lorries go a different way....or just walk somewhere else!!! The fact is that it is on the definitive map of footpaths, and is shown on every Ordnance Survey map. Which is,of course,why the Council had no choice but to bow to pressure. That does not make it right or sensible. Applications can also be made to remove paths from the definitive map. I know that in the past I have spent a good amount of time looking for it. It should never have been blocked off, though it may well have been decades ago that this happened. Many things happened 'decades' ago this doesn't mean they are worth resurrecting. A group of people ( not even necessarily local and probably in single figures) should not be able to dictate to the wider 'public' where their councils MUST spend public money. The benefit to 'the general public' is questionable. Nationally, the Ramblers Association is campaigning to ensure that public rights of way are not lost for ever, which is what will happen if they do not complain. I personally raised this missing path under the Ramblers' Big Pathwatch campaign, and I know that it has been raised by others too. The path is not a "footpath to nowhere" - it is a path to Kirk Hallam, and I suspect it will be well used by walkers. As previously pointed out, blanket claiming of unsuitable paths is a waste of public resources. This path has a limited use to a small number of local people, (if any and all 'walkers') There is only a 'suspicion' that it will be well used..... A lot of money to waste on a 'suspicion'! ​..............And that's just what pressure groups like the ramblers are insisting upon!